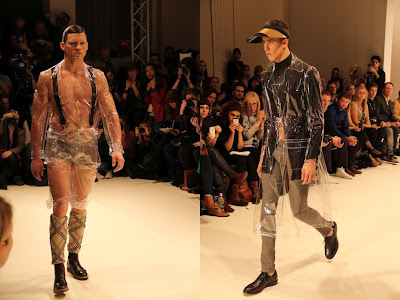 I was lucky enough to be given a gift of seated tickets to the OTW Menswear Catwalk show. Lee Lapthorne, Textiles designer and Founder of Doll- Creative events agency gave me these tickets due to the hard work and determination I was showing during my placement for On|off atLondon & Paris Fashion week. The Catwalk was showcased by Vauxhall Fashion Scout, there was some fantastic collections the first of which being Bodybound. Bodybound Autumn / Winter 2012, created by young talent Kim Choong-Wilkins, is a heady futuristic collection, taking inspiration from Blade Runner and 2001: A Space Odyssey. The collection showcased gold cropped jackets with heavy shoulder detailing and matching visors. The gold knitwear was particularly different as well as a wide use of transparent plastic to show the outfit beneath. Ones To Watch: Bodybound AW12-13 Catwalk Show from brightonart.tv on Vimeo. 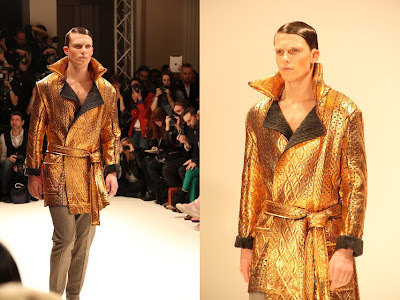 Just amazing collection especially that gold cropped jackets with heavy shoulder detailing and matching visors. Thanks for sharing information of this great collection. I think seo Melbourne will probably be good.